nurses from leaving their profession. 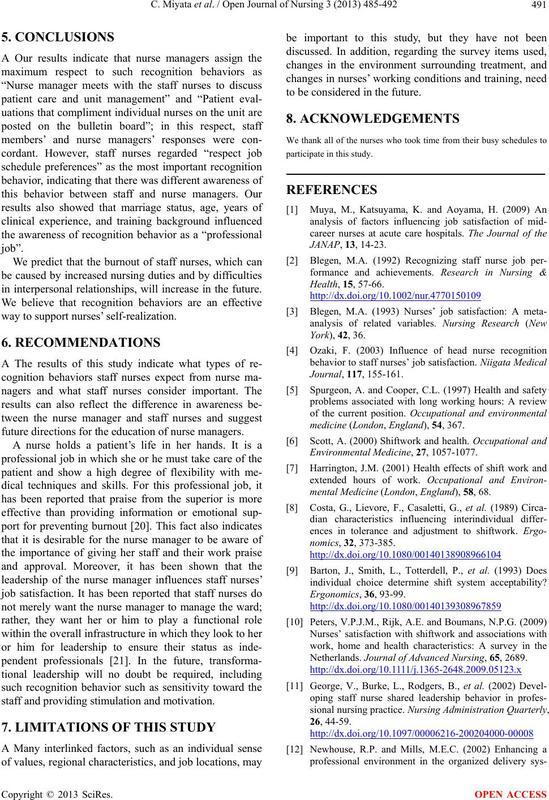 about recognition behavior developed by Blegan . “fully agree” to “fully disagree”. lowed by the Bonferroni test. 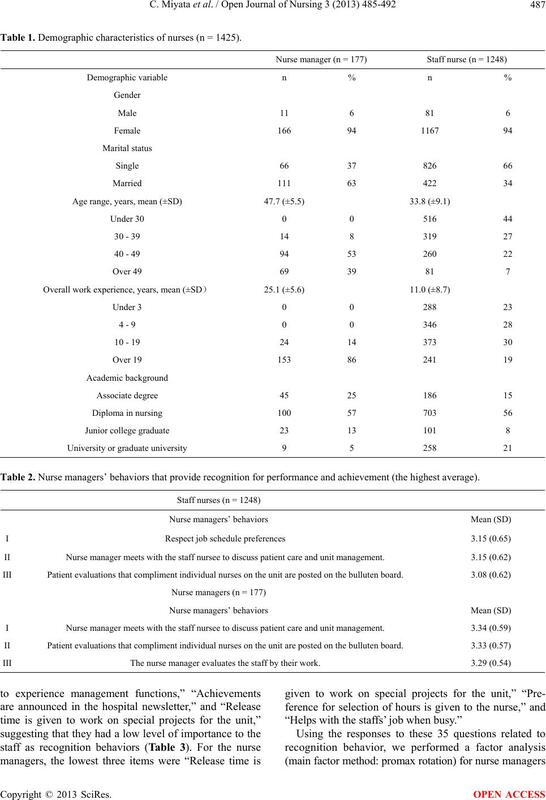 managers were women, and 63% of them were married. The mean age was 47.7 years (range : 42.2 - 53.2 years). duate school education (21%; Table 1). recognit i o n behavior. Table 1. Demographic characteristics of nurses (n = 1425). Table 2. Nurse managers’ behaviors that provide recognition for performance and achievement (the highest average). Table 3. Nurse manager’s behaviors that provide recognition for performance and achievement (the lowest average score). peers”) were excluded, for a total of 11 excluded items. indicating the reliab ility of the questionn a ire (Table 4). considered important in those areas (Table 5). Table 4. Resu lt of exploratory factor analysis on recognition behavior. Table 5. 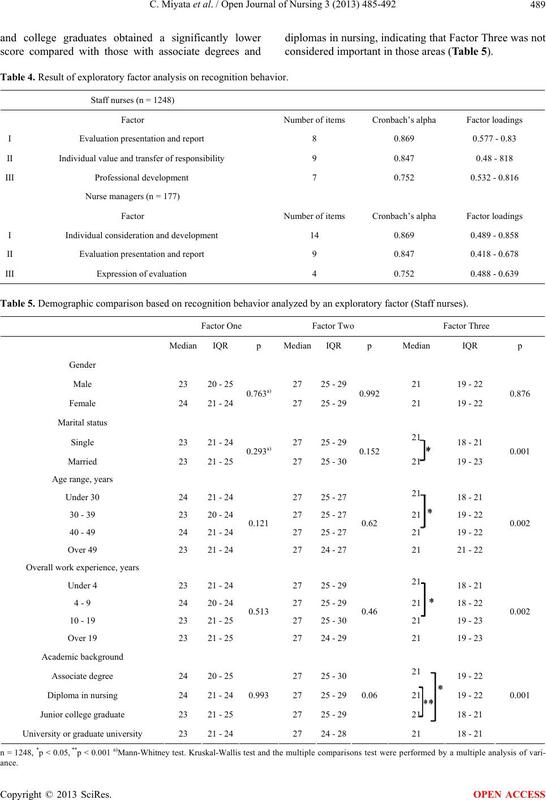 Demographic comparison based on recognition behavior analyzed by an exploratory factor (Staff nurses). as a major threat to employees’ health and well-being. somatic symptoms, such as digestive problems [5,6]. ment and staff roles may not be clear to staff nurses. 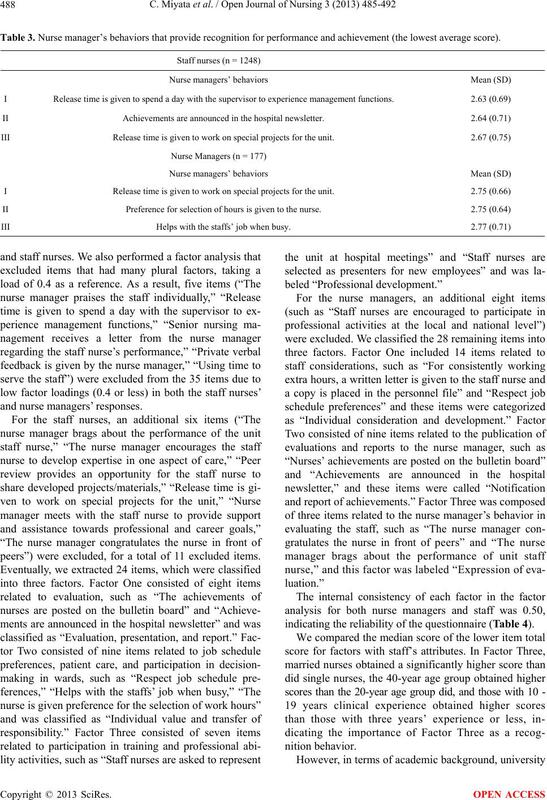 were excluded from the factor analysis for staff nurses. 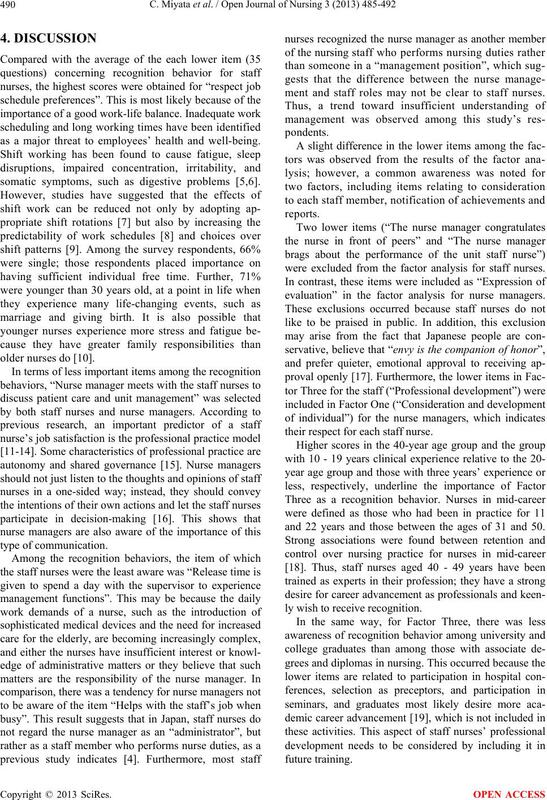 evaluation” in the factor analysis for nurse managers. their respect for each staff nurse. and 22 years and those between the ages of 31 and 50.
ly wish to receive recognition. in interpersonal relationships, will increase in the future. way to support nurses’ self-realization . future directi o ns for the educat i on of nurse managers. staff and providing stimulation and motivation. to be considered in the futu re. medicine (London, England), 54, 367. Environmental M e d ic i n e , 27, 1057-1077.
mental Medicine (London, England), 58, 68.
individual choice determine shift system acceptability? Netherlands. 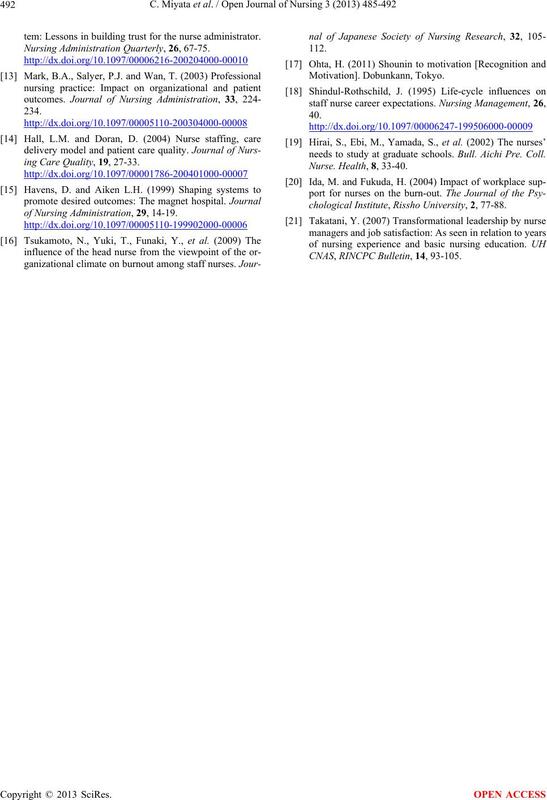 Journal of Advanced Nursing, 65, 2689.
tem: Lessons in building trust for the nurse administrator. Nursing Administration Quarterly, 26, 67-75.
ing Care Quality, 19, 27-33.
of Nursing Administration, 29, 14-19.
needs to study at graduate schools. Bull. Aichi Pre. Coll. chological Institute, Rissho University, 2, 77-88. CNAS, RINCPC Bulle ti n, 14, 93-105.